A classic biscuit with a caramel twist. "A pleasant biscuit but for me the caramel is too gooey and detracts from the straight chocolate kick." "Nice combination of chocolate and caramel." 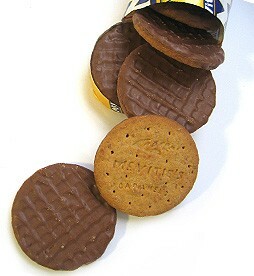 "What's not to love about this biscuit? It's the dream combination of biscuit, chocolate and caramel." "Interesting combination of crumbliness and chewiness of the topping." "A trusted favourite with a delicious twist. A real tasty treat." "Lovely gooey caramel. What a treat!"